Last year, six hours before Ms Cherin Chong was to take her final examination for her international business course, her waters broke. "I felt a straining sensation in my tummy and when I went to the bathroom, I found that I was leaking water and the mucous plug had dropped," she says. But she insisted on taking the examination anyway, instead of waiting three to six months for the next one. "The company wouldn't give me a raise unless I got a diploma and I needed to make money to support my family. The diploma was really important," says Ms Chong, 25, who was working as a personal assistant to the director of a real estate company at the time. 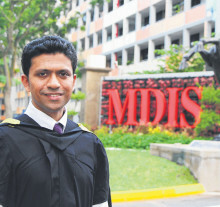 Her school, Management Development Institute of Singapore (MDIS), allowed her to sit the examination but on the condition that she had someone accompanying her in case of emergency. Once in the examination room, Ms Chong took a seat in the corner closed to the door, and just when it looked like everything was going smoothly, her contractions started. " It was so painful and it kept getting worse," says Ms Chong, who rushed through the three-hour-long examination in half the allotted time. With her mother, who had been waiting at the school, she then races to Mount Alvernia Hospital. At 9 am that day, she delivered daughter Nicole, her first child who is now eight months old. Her story has a happy ending: She scored an A and collected her diploma last October. A pregnant woman's water bag can break at the inopportune of times, a very public example of which occured last month when Channel 8 newscaster Zhao Wenbei's waters broke while she was LIVE on air reading the news. But this is often not as dramatic a situation as it sounds, doctors tell SundayLife! Dr Jazlan Joosoph, 42, consultant obstetrician and gynaecologist at Raffles Hospital, says: "Don't be influenced by what you see in the movies when a woman's water bag breaks all over the floor and everyone starts to panic. It does not happen to everybody, even then, the baby isn't coming immediately." The "movie" scenario occurs for only about 20 percent of expectant women. Ms Lorie Meyer, 37, was among the 20 percent. Her water bag broke while she was on the MRT train on her way to an Eric Clapton concert with her husband on Valentine's Day 2011. "I thought I had felt a little but of a leak an hour before getting on the MRT, but didn't think much of it," she says. It was not until she was given a seat on the crowded tram that she felt a change. "As soon as I sat down, I felt a pop, like a pressure release, and I was suddenly soaking wet. I was sitting in a puddle and there was lots of fluid," recalls the Canadian expatriate who now lives in Vietnam. Her maternity jeans were soaked through to below her knees. Ms Meyer and her husband got off the train at the Dhoby Ghaut station and took a taxi back to their apartment in Great World City." I was not embarrassed about it. Your mind gets taken over by the face that you are about to have a baby. I as most concerned about getting back to a place where I was comfortable," she says. About 14 hours later, she gave birth to a baby girl, their second child, at Mount Alvernia Hospital. The water bag is a membrane full of amniotic fluid which protects the baby in the uterus. For some women, the water-bag breaking is a sign that the body is readying itself for labour and results in a slow, constant trickling or sudden gush of water between the woman's legs. The fluid is odourless and typically clear or lightly yellow or pink, and can run continuously for between five minutes and a few hours. However, in most cases, the water bag does not break until contractions have starte and the woman is already in labour. Ms Lydia Seow, 39, midwife and nurse clinician in the department of obsterics and gynecology at the National University Hospital, notes that women who experience a pre-labour water bag break will typically go into labour within 24 hours. It happened much quicker for public relations executive Jannah Muhammad Ismaeil, 29. When her water bag burst at about 6 am, she thought she just needed to go to the toilet. "I woke up an felt a little bit of pressure in my tummy. When I got up, all this water came out. But but the time I got to the toilet, it mostly stopped, so I thought I just needed to urinate could not make it to the toilet in time. I did not think much of it, " she says. Groggy from having gone to bed late the night before, she went back to bed. Twenty minutes later, her first contractions started in full and Ms Jannah went from lying on her back to standing on her hands and knees, a pain-relieving pose she learnt in her prenatal yoga class. As her contractions intensified, she gave instructions to her husband, actor Firdaus Abdul Rahman, 33. He says: "In theory, I knew what to do because we had been to prenatal classes. But at that time, I was completely blank. I tried to get my bangs ready for the hospital but could not remember what to pack." He asked if they should go to the hospital, but Ms Jannah knew that contractions could last for hours and did not want to be in the hospital longer than necessary. She decided to wait and call for help only when the pain was unbearable. But by the time Mr Firdaus called for an ambulance 10 minutes later, she felt the pressure of the baby's head and told her husband to remove her clothes. Soon, their infant son's head was already out and a couple of minutes later, the rest of the baby followed, straight into his father's arms. And so little Muhammad Ilhan Rezqy, their first child, was born within an hour of Ms Jannah's water-bag breaking. She says in jest: "It was the F1 weekend and we call him the F1 baby. He couldn't wait. He was just racing to get out." Doula and labour coach Ginny Phang, 36, says, "Some people prefer to stay at home after the water bag bursts and wait until contractions start before going to the hospital. But they must check that the waters are clear and there are no fever or chills or discoloration, which could be sign of infection." If any of these signs are present, the mother must go to the hospital immediately. Such a quick delivery like Ms Jannah's is extremely rare, particularly for a first pregnancy, says Dr Jazlan. "Labour can be quite unpredictable but it typically lasts anywhere from eight to 16 hours, or more." The best thing a woman can do when her waters break is to not panic, he says. "Inform your spouse, get your bag and go to the hospital. There is ample time to react. The baby usually won't come immediately." So was Mr Firdaus scared that his child did come almost immediately? "Of course. But then I saw his head, I knew it was time - there was no choice. "It was my baby and my wife," he says. "I didn't expect to be the very first person to hold him."